Following reviews from others working in accessibility, inclusion and Higher Education, I’ve been watching footage from the recent Handheld Learning Conference in London. Extensive online proceedings including video are available on the conference website and via iTunes. I’ve supplied links to videos alongside notes on the first 5 presentations from the Inclusion Session below. Notes from Sal Cooke’s presentation are most complete due to the range of sources she draws on and my own interest in the projects she cites. For brevity, this a descriptive account, not an analytic one. As I did not attend the conference myself, comments are very welcome. 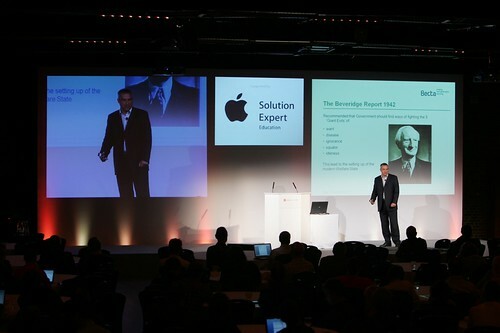 Please note all links open in a new window and many presentations feature slides that are not audio-described. Inclusion Session Introduction: Donald Clark (video, predominately audio) 8 mins. To what problem is ‘inclusion’ an answer? Doesn’t everyone have a mobile? Is ‘Digital Divide’ an outmoded term? It’s no longer a poor/rich divide, but a series of fractures. Specifically, here Clark identifies a disjuncture in the UK between ‘analogue’ educational practices in schools and the ‘digital’ world that characterises nearly everything else. Can inclusion actually result in exclusion? The fact that the few don’t have the technology means the many don’t get anything. In terms of accessibility discourse, I feel this relates to the observations made by Brian Kelly and others regarding the development of Adaptable and Accessible practices. Video and other media from Brian’s presentation at TechShare are available via his blog. Has the ‘Digital Britain’ report helped or hindered our digital future? It’s largely about TV, Radio and Newspapers or punishing file-sharers. Clark also questions policy approaches, making a strong critique of Digital Britain, identifying how a scoping document has become a punitive exercise. Speaker 1: Niel McLean: ‘Inclusion: The Home Access Story’ (video) 20 minute talk and 5 minutes of questions. Note: This presentation opens with brief use of Russian in an illustrative point at the start of the talk. Niel McLean is Executive Director of Becta (the British Education and Communications Technology Agency), here he introduces the Home Access project which seeks to ensure that all pupils in state education in England have the opportunity access to computers and internet connectivity for education at home. The programme supplies funding to achieve this. Aside from McLean’s discussion of socio-economic deprivation as a distinct category within the inclusion agenda, this talk includes a valuable dissection of the political grounds for Government’s role in ensuring home-based access to education. Speaker 2: David Cavallo on One Laptop Per Child (video) 35 minutes. 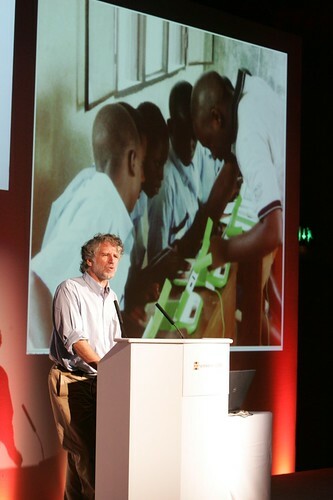 David Cavello is the Chief Learning Architect at MIT on the One Laptop Per Child project. One Laptop Per Child is a renowned project that aims to create educational opportunities for the world’s poorest children by providing each child with a rugged, low-cost, low-power, connected laptop with content and software designed for learning. Cavallo is a charismatic speaker and news on the progress of the project is always engaging (as is Dr Sugata Mitra’s Hole in the Wall project in India). Questions and answers relate to bandwidth, collaboration and infrastructure. Speaker 3: Elizabeth Hayes ‘What can we learn from The Sims about inclusive Game Based learning?’ (video) 25 minutes. Hayes’ focuses on gender and games based learning, reporting the educational implications bourne out of non-traditional gamers (middle-aged women) approaches to game design and ‘modding’ The Sims. So are the issues the same, or have they changed? Cooke covers several key areas for contemporary deployment of mobile devices and digital content. Specifically she cites issues with assessment and the process of assessment for those who require additional time and assistive technologies. How will these learners’ needs be met? Help teachers to provide different learning activities to suit different learning styles or preferences and different ability levels. Cooke stresses the need for this approach to be transferred into other educational sectors. She also refers to findings from MoLeNET research to refute common myths that mobile technologies might ‘somehow be inappropriate or too difficult for learners with learning difficulties and/or disabilities‘ or that ‘allowing the use of mobile technologies, particularly mobile phones, in schools and colleges would make it difficult for teachers to control classes and would encourage inappropriate behaviour‘. To support this, Cooke cites evidence and best-practice case studies available via MoLeNET and describes how mobile devices can assist in a multitude of different situations. She also lists the publication GoMobile as a source highlighting many innovative uses of handheld devices. Next Cooke illustrates how technologies have moved into the home and represent an untapped learning resource that arguably represents the crux of the Inclusion agenda. One slide depicts a toy pen from ToysRUs that helps children learn to read. Cooke observes that this is the same technology that was being given to dyslexic students as an assistive technology only a couple of years ago. She indicates how assistive technologies are now cheap, mainstream and in the home and broadly conceived as ‘gadgets’. This research also shows that the vast majority of participants do not want to speak into their device to navigate content, but they do want to hear it. Rix Centre (University of East London) work on symbol card recognition, enabling users to surf the web and listen to emails using only symbols. The addition of Radio Frequency Identification (RFID) to new phones in 2010. RFID has been used by the RNIB for years. With international roll-out immanent, educational applications of RFID are being developed. Cooke goes on to refer to ‘Independent Specialist Colleges: Specialists in Innovation citing the innovative work undertaken within Special Education. She asks how this wealth of knowledge can be married to mainstream practice to for mutual benefits in national programmes. How can we make a real difference? How do we equip staff with the necessary skills? Will mobile learning require new kinds of teaching? Here Cook returns to the push of new technologies that are changing inclusion work, using the example of RoboBraille, winner of the European Access-IT award. Robobraille is a free ‘phenomenally powerful resource’. Users send a word processed document to an email address, the document is returned in DAISY format. DAISY, the Digital Accessible Information System, is a format for digital audio books for people who wish to hear and navigate written material presented in an audible format. Cooke states the institutional focus must be on Continuing Professional Development. What do people do with technologies in their roles? Do people create mobile resources? Do they apply different teaching techniques? Or do they use mobile devices predominantly for collaboration and communication? How many people know what is in their Single Equality Duty Scheme about Mobile learning? How do we upskill this workforce? Cooke closes the presentation re-asserting print impairment as a major access issue. Under this topic she refers to contemporary developments in e-books and e-publishing within Education. Finally, in response to previous presenters, Cooke asserts Digital Inclusion a matter of rights, not politics. For some people it is life. She quotes a learner in a specialist school to underline this fact: ‘I cannot speak but I use my phone all the time, because I want my mum to be able to see me and see how I am’. Over the past couple of weeks I’ve had a lot of hits from people looking for online learning materials to support a new term of CACDAP courses in British Sign Language (tap BSL into the search box if you’re looking for links to video resources). As a result I’ve been thinking about the BSL resources found online more generally. On Tuesday I was at AbilityNet’s ‘Accessibility 2.0: a million flower’s bloom’ conference. An early tip was Australian presenter Lisa Herrod (@ScenarioGirl), a consultant from Scenario Seven, and expert in User Experience for Deaf users. Her talk ‘Understanding Deafness: History, Language and the Web’ blew this subject wide open. Lisa’s presentation and slides are now available via AbilityNet. A transcript will become available soon. people tend to group deaf, Deaf and Hearing Impaired users into one big group of people who “just can’t hear. Most of us know someone that has diminished hearing through age or industrial damage, noise etc. But few of us understand Deafness from a cultural, linguistic perspective, i.e. from the perspective of those Deaf who use sign language as a first language and may not be fluent in English as a second language. British Sign Language is the first language for approximately 50,000 Deaf people in the UK. This gestural language is wholly different to spoken and written English. Lisa highlighted how developments from texting through to video conferencing have had a huge and positive impact on distance communications for the Deaf community. In this sense Web 2.0 provides powerful tools for Deaf people to come together. However, Lisa also showed how internet resources can cause problems for Sign Language users due to an over-reliance on large amounts of complicated text; text that assumes a fluent native speaker. In short, Web 2.0 is effective for Signed collaboration, but the textual basis of content is still a problem. So far, these observations have clear intersects with accessibility issues for foreign language speakers and people with print impairments such as dyslexia. However, a specific barrier unique to Deaf people online can come in the form of video captioning. In discussion, Lisa identified a vital distinction between captioning and subtitling. Captioning reports speech directly into text, whereas Subtitling is more interpretive and intended for quick and easy understanding. Where a person with dyslexia might watch and listen to a video rather than read a text, with dubbed versions available to French or Chinese viewers, interpretive subtitling allows a Deaf person to understand and take in visual content. Another powerful message from Lisa’s presentation relates to the global status of BSL more specifically. Early in her talk Lisa refuted a common popular misconception that Deaf people across the world have the same signed language. Spoken English and American English are nearly identical, but British Sign Language and American Sign Language (ASL) are very different. In fact, ASL has more in common with French Sign Language due to a shared linguistic ancestry stemming from the 1800s. As with the development of any language, Sign Languages have grown out of small communities and expanded simultaneously from disparate beginnings. This history forcefully underlines the difference between ASL and BSL, but what does it mean for the web? BSL speakers are a linguistic minority online. American English is a dominant internet language, and in my experience, American Sign Language also dominate searches and resources. BSL is from the same family of languages as Auslan (Australian Sign Language) and New Zealand Sign Language, but the American orientation of internet culture made it difficult for me as a BSL beginner to find resources relevant to the UK beyond established portals and communities. In these terms, British Sign Language must be prioritised online at every level. Other accessibility concerns may be solved or mediated with international expertise. But the national and linguistic independence of British Deaf culture means that accessible video/text and BSL materials must be prioritised in the UK. Time for me to sign up for BSL Level 2. Making sure everyone – young, older and disabled – is included in our digital future. By 2050 more people will be over 65 years of age than under 16 in the UK. Newcastle will work with older people to design simple, intuitive interfaces tailored to their needs. The Newcastle Hub is the first to launch a website and can be found at: http://research.ncl.ac.uk/side/. Many will argue that if they do not know about the issues, they can’t be guilty of being ‘disablist’. I struggle to think of a valid reason why a web professional should not know about, and practise, web accessibility. Of course, accessibility isn’t binary, and there are many grey areas. But the fact that we still see many of the “school-boy” errors (missing descriptions for images, text that won’t resize, etc) means that there is a long way still to go to get anywhere near an acceptable global standard. And like it or not, every single person who makes the choice not to spend the 20 seconds giving that image a suitable description, or thinks that aesthetics beats usability, or who assumes blind people wouldn’t be interested in their site anyway – these people are the embodiment of disablism, because they have relegated the needs of those users (for whatever reason) and, by that action, cast them as inferior. The issues James raises are an important and, I think, highlights the subtle ways in which discrimination and exclusion are propagated online. I would call this Aversive Disablism. Aversive Disablism is a process identified by Mark Deal. His paper ‘Aversive Disablism, subtle prejudice towards disabled people’ (Disability & Society, Vol 22, No. 1, January 2007) observes that blatent forms of prejudice towards disabled people appear to be declining in the UK. However, subtle forms of prejudice remain and persistently damage progression towards an accessible and equitable society. Aversive disablists recognize disablism is bad but do not recognize that they themselves are prejudiced. Likewise, aversive disablism, like aversive racism, is often unintentional. Aversive racists, Gaertner and Dovidio argued, are not anti-black, but pro-white. Likewise, aversive disablists may not be anti-disabled, but rather pro-non-disabled. Deal makes several key observations. Firstly that this in-group favouritism can be can be as damaging to disabled people as more overt prejudiced behaviours. Secondly, it highlights how people who believe they hold a liberal attitude towards disabled people (including those with disabilities who do not identify as disabled) may support behaviour and social policy that excludes other disabled people. This is not to argue that the building industry is inherently disablist, but, as Young (1990) noted, ‘The conscious actions of many individuals daily contribute to maintaining and reproducing oppression, but those people are usually simply doing their jobs or living their lives and do not understand themselves as agents of oppression’. In his blog post, I think James is observing the damaging actions of aversive disablist web developers. When commissioning or building websites it’s vital that we recognise this subtle prejudice. Yesterday saw the launch of the newly formed Digital Inclusion Forum set up by the Technology Enhanced Learning Programme, which is funded by the ESRC and EPSRC and directed by Richard Noss here in the UK. In 2008 BECTA‘s Disadvantaged Learners Report observed that the lack of a single voice in UK policy championing disadvantaged learners has led to unhelpful fragmentation – particularly in addressing digital disadvantage across education. Hopefully this Forum will help to draw together disparate resources and streams of research and practice to give more cohesion to those seeking to mitigate exclusion within technology enhanced learning. To discuss and evaluate the contribution that the TEL research programme can make to the digital inclusion research agenda. The first phase (May-November 2009) will be the development of an online space for sharing digital inclusion related resources, discussing inclusion-related issues and scoping priorities for digital inclusion research. It is hoped the online space will be a platform for the collaborative writing of a web-based document that starts to draw together what the key issues are in relation to digital inclusion research. The second phase (December 2009-September 2010) will involve the setting up of a commentary group who, drawing on the web-based document will co-author a TEL branded publication which offers a commentary on digital inclusion research and highlights the contributions of the TEL projects to the field. The forum welcomes input, with invitations being issues specifically around contributions to an emergent Digital Inclusion Reference Library and posts to the new discussion forum. The forum also notably draws on blogs and other resources tagged with ‘digitalinclusion’. This marriage of expertise and materials will hopefully accrue into a valuable resource for everyone working to achieve access and equity in technology enhanced learning.